Adwoa has been teaching and performing since the age of 13. 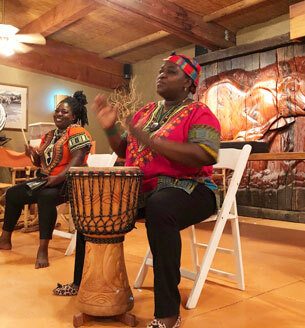 Growing up in Ghana, drumming was considered a taboo for women but she has been able to break down these barriers and misconceptions surrounding women drumming in Ghana. In 1999 she was recognized and awarded the title as the Only Versatile Female Master Drummer in Ghana. She still holds this title. Adwoa is very passionate about drumming and teaching and has travelled to Sweden, Denmark, Germany and the U.S. sharing her culture. Adwoa embraces everyone on different levels of the drum experience. She is willing to teach and believes drumming to be healing and also one that brings us all together in love.